Continuum, Arraymusic and the Music Gallery join forces to bring the artistic vision of The Netherlands’ famed Gaudeamus Muziekweek to Toronto. For decades Gaudeamus has been one of the most important breeding grounds for new directions in music. In this two-night summit, local and Dutch musicians and video artists express the latest in improvisation, and the ensembles of Continuum and Arraymusic are joined by Dutch musicians in works that crackle with Gaudeamus spirit. This performance features the World Premiere of Babbitt by Michael Oesterle. 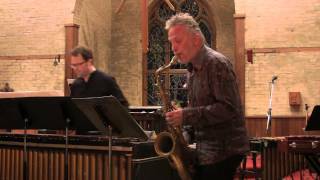 Continuum’s ensemble with The Array Ensemble, Michiel van Dijk (saxophone), Koen Kaptijn (trombone), Nora Mulder (piano), Rob MacDonald (guitar), Bas Wiegers (conductor). $30 adults / $20 seniors & arts workers & Music Gallery members / $10 students. Tickets available at the door on the night of the performance.